Architect Academy is an excellent new activity book that, along with all the information and illustrations, includes stickers, a press-out model of a tower and a poster (with a board game on the other side). After an introduction to six famous historical buildings (like the Parthenon and the Pyramids) and six famous modern buildings (like Paris’ Pompidou Centre and London’s Shard), it explains the process of design and construction. Learn about design briefs, floor plans, site plans and 3D models. Try drawing to scale and practice calculating measurements. There are also instructions for creating a perfect pyramid and your own bridge. All aspects of construction are covered, including: who does what on the construction site, types of building materials, how to design for different climates and how to be ecologically friendly. The role of gardens and parks is included in a section on landscape architecture, and the inside of buildings is addressed by an interior design section. You’ll discover different types of structures, and weird and wonderful buildings like one that looks like a basket (the headquarters of the Longaberger Basket Company), a bird’s nest (the National Stadium in Beijing), and part of a Polish shopping centre that looks like a crooked house. There is so much packed into Architect Academy. By the time you’ve worked your way through it, you might even be ready to start your own architectural firm! 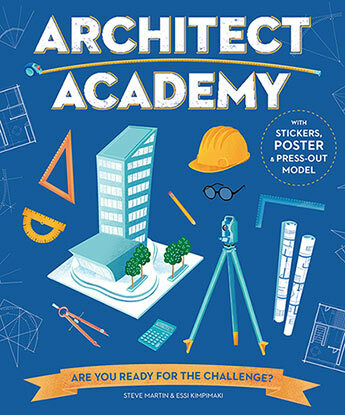 Highly recommended for budding builders and architects. Architect Academy will keep them busy for hours.